Our apartments store a lot of stuff: furniture and lamps, hanging posters and pictures, everyday utensils and knickknacks distributed about. Among all these collections is often one object with a very special story behind it, which it would likely tell us for itself if it only could. In Marko's* living room hangs a portrait of his parents. Its black, gray and white tones stand out from its smooth, wooden frame. The portrait was painted by Marko's sister, many years ago. She gave it to him when she moved out of their parents' apartment on her 18th birthday, Marko five years her junior. She took a travel bag and a suitcase and left him with the words, "this painting should remind you of how happy our family once was." She told him that if there were any problems to let her know, and with that she was gone. Marko's apartment looks just like any other apartment. It's modern, functional, and cosily untidy. In the small room there is a bed and a dresser. In the big room, in front of a window, is a chair and a desk covered with various cables, a printer, and a laptop floating atop disorderly stacked papers. To the side stands a tiny table, somehow managing a humungous television, and next to that a record player with four records on top: Requiem of Brahms, Mozart, Verdi, and Samuil Marshak's Das Tierhäuschen, 'the little animal house.' Bookshelves line both walls of the room, from the window to the door, replete with works of fiction, history, and science fiction, office folders and journals. Scattered across the coffee table in the middle of the room lay pencils, highlighters, sprawled open books, mountains of sticky notes, two full ashtrays, a dish sprinkled with crumbs beside a coffee cup holding caked over coffee grounds. Sandwiching the coffee table are two arm chairs, one embracing an exhausted Marko, the dark circles beneath his eyes telling the all too familiar tale of multiple all-nighters precursory to final exams. Amongst this typical student setting, everyday objects strewed about, the portrait of Marco's parents doesn't quite belong. Where he's placed it feels odd too: tucked away in the bottom shelf, neighboring the door frame. But what stands out about the painting isn't the painting itself but the leather belt Marko used to decorated it. Why the 13 year old Marko should have called on his sister has everything to do with this belt. It belonged to his father, the single thing he left with his mother since leaving two years before Marko's sister left. 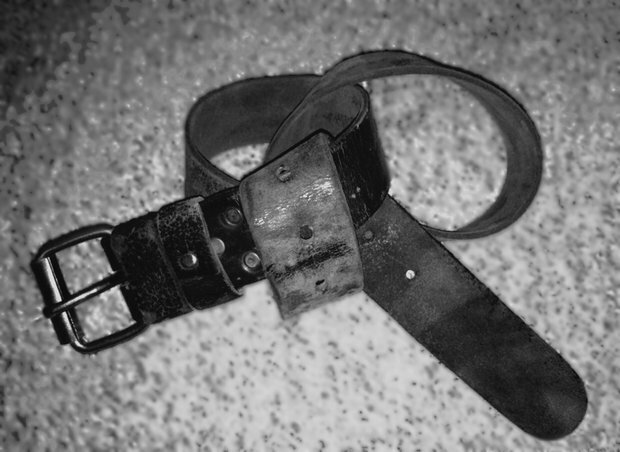 This belt was the tool his father, then later his mother, used to punish Marko for small offenses ever since he was seven years old. He bordered the belt around his sister's painting, in honor of "the good old times." In Marko's fantasy, the portrait hangs not near his door frame, but by some house corner or tree where dogs would fulfill their daily business, leg lifting and peeing, week after week, year after year. *Name was changed to protect the identity of those in the portrait.